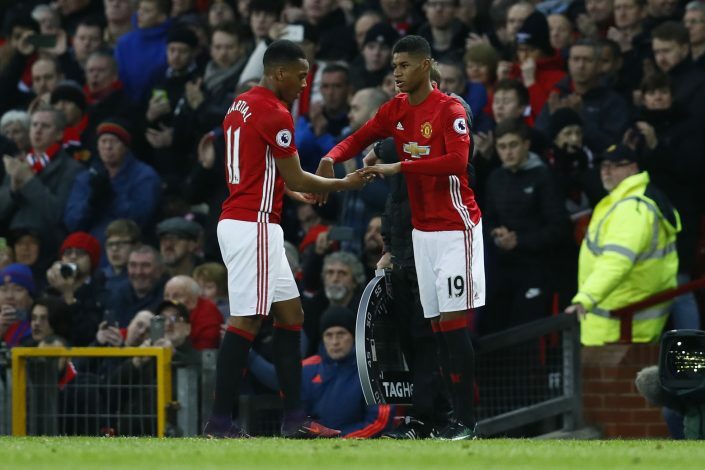 Both Anthony Martial and Marcus Rashford have been providing a selection dilemma for Jose Mourinho since the start of this season. Since he employs them on the left wing, they are highly interchangeable, and function best when the Frenchman is subbed on in place of the young English player. However, this could change on Tuesday in the Champions League. In a press conference leading up to the fixture against Benfica, Mourinho discussed the possibility of deploying both forwards, who have been in brilliant form throughout the season. The Carabao Cup fixture that the United boss refers to is also a competition where the duo has started together the most, and achieved great success, albeit to teams of a smaller league. However, the 11 matches where the two youngsters have shared the pitch so far certainly don’t bode well. In the Premier League, this combination has been employed five times, out of which United have failed to grab a victory, drawing four times and losing once. Further, since they have all but qualified for the next stage regardless, the match will certainly be seen by the former Chelsea manager as a low risk one, the only kind in which he does such a feat. But the question does loom very strongly over their heads. On Saturday, Martial’s goal was decisive in securing three important points against Tottenham. Football’s old adage swears that one should never change a winning team, and that’s what Mourinho might stick by.